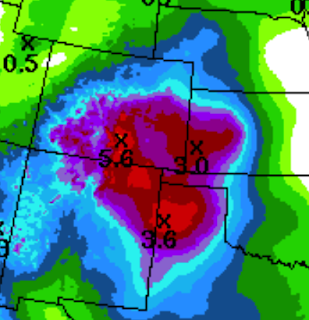 For this part of our nation, these rainfall amounts are high, especially near the Colorado-New Mexico border. Risk of flash flooding is high. 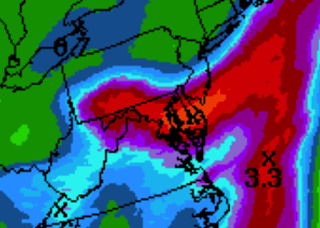 While it is hard to see the amounts, 4-5 inches are expected to fall on already wet soil in southern Pennsylvania, Maryland and Delaware, especially the next 30 hours or so. Flash flood risk is high. The challenge in the Rockies isn't the storm you see in front of you, it's the storm dumping rain 20 miles upstream from you. That normally docile creek rises real quick. Our signs say "Climb to Safety", not "Turn around, don't drown" - at least in the mountains.